With its golden green foliage, Philadelphus coronarius ‘Aureus’ is deciduous shrub that adds colour to the garden. Fragrant white flowers in spring to summer make this a wonderful addition to the garden border. It will grow well in dappled shade, and with the the bright foliage adds a real lift to a shaded position. It will flower well in light shade, however in deep shade flowering may be limited. This is a very easy to grow plant, it requires very little care once established, and be left unpruned for a number of years. Over time Philadelphus coronarius ‘Aureus’ will reach around 2 metres in height with a similar spread. Best in a humus rich well drained soil. 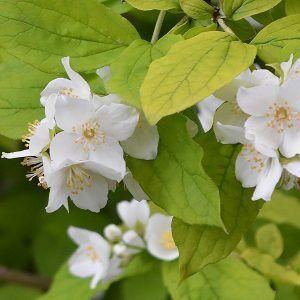 Philadelphus coronarius ‘Aureus’ will be reasonably drought tolerant once established and can be grown beneath deciduous trees. Pruning will make a denser compact bushy plant, we do however like the open growth habit of the unpruned specimen in our own garden, therefore we rarely prune the plant. In you wish to prune, this is a forgiving plant. You can remove unwanted growth in late winter, or you can cut the whole plant back to the ground if you wish.